The way apps engage with people about data use can be quite cold and formal. What if it was more natural, more familiar, more relevant and human? Fanfare is a fictional music app that connects people to the best live concerts and music based on their location and taste. 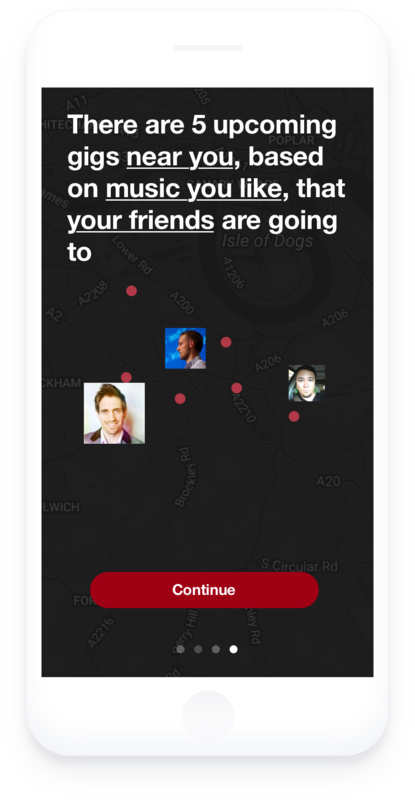 Location data is used to initially find concerts nearby and then make ongoing suggestions. Third party data is used to tailor suggestions to people's tastes. The more Fanfare knows, the better the recommendations. People are being asked to provide a tremendous amount of data during sign up before they have an overall sense of the trustworthiness and usefulness of the service. This is especially challenging when services ask for multiple data sources, including 3rd party data, at the outset. The cross-functional Design Jam team challenged themselves to consider how Fanfare could make asking for location information, and connecting to 3rd party data sources, feel necessary in order to provide exceptional value, and therefore make people feel that the data exchange was worthwhile. ...layer information visually, clearly and concisely? Through an enjoyable, step-by-step on-boarding process, Fanfare shows people how their personal data can help the app provide better recommendations. The conversational search string, alongside the clear visual cues of ever-decreasing dots on a map, helps people see the value exchange of their data, and more personalised results. 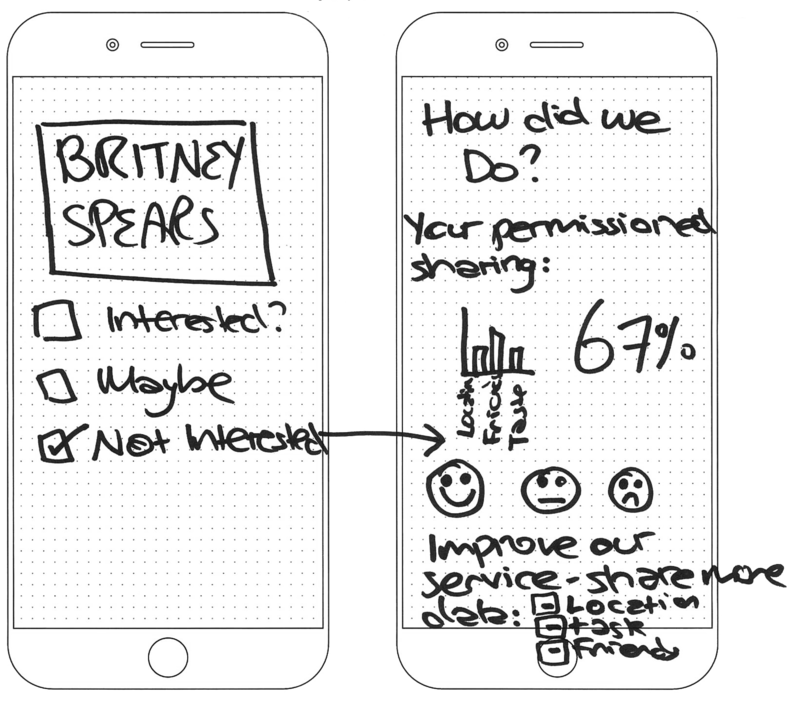 The contextual nature of this consent flow makes sharing data feel natural, as people can see how what they give will help them get what they like most. It's a powerful way to cultivate and foster trust. 'Granular control' was a recurring theme amongst several Design Jam teams. Similarly to Oink, Fanfare came up with a solution allowing people greater control over their data, while clearly conveying the value exchange for doing so. These choices give people granular control and do not presume consent to gather location to be continuous. If the person is happy with the service over time, they may just select 'Yes, all the time,' in the future once trust is established. Make the connection to 3rd party data sources feel great for people? Give people more granular control over the personal data they consent to sharing?